“Well I certainly won’t forget my first ever visit to Thruxton! It started with my best qualifying of the season and ended with a couple of crazy races in conditions resembling a monsoon. As I was saying last week, because you’re not allowed to test at Thruxton I tried to prepare for the weekend with a few laps on a simulator at a local race team. Unfortunately, things didn’t go quite to plan. The machine developed a technical fault after only half a dozen laps, but at least I got a feel for what to expect. Thruxton is very fast, with lots of long flat out bends. It took a couple of laps to settle in but I soon felt comfortable in qualifying and was really pleased to find myself running in the top ten until the very last lap when a couple of other guys just pipped me into twelfth position. Still, it was my best qualifying of the season, so we’re continuing to make progress. 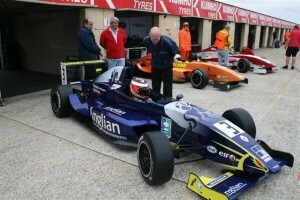 Just before race one it started to rain, so off went the slicks and on came the wets. I made a good start, moving up to 10th but someone clipped the rear of the car going through turn two and spun me round a full 360 degrees. It left me right at the back, but I managed to recover to finish 14th. By the time of the second race it was raining really heavily. I’ve never driven in anything like it. Again I got past a couple of others on the first bend but as we raced towards turn two you just couldn’t see anything through the spray, not even the red lights on the back of the cars. I just kept my foot in and completed the first couple of laps in 10th place until I hit a massive puddle and aquaplaned off the track. I couldn’t do anything about it. I wasn’t the only one to go off but it spoiled the chance of a good result and I ended up finishing 15th which was frustrating. The good news is my lap times were really competitive and it was good experience in my first really wet race, even if it was a bit hairy at times. Anglian Home Improvementsis formerly known as Anglian Windows. Supporting peoples’ development since 1966.